Adorn a corner of your landscaping with classic style using these Achla Graphite Aldrich Trellis Side Panels. This set of two, durable wrought iron panels enhances any setting with traditional curves and color, for a timeless look in your yard. Intricate scrollwork on the bottom half of each piece easily captures attention, while contrasting the vertical rods on the top half. A slight curve forms the top of each unit, bringing extra height to them, and perfectly matching the top of your existing Achla Aldrich Trellis (not included) for a striking garden screen. The graphite color of each piece gently enhances foliage, and the powder coating protects the units from the elements. The pointed end of each leg inserts into soil easily, and the panels disassemble for seasonal storage. Turn a corner of your yard into a focal point using these Graphite Aldrich Trellis Side Panels. Some assembly required. 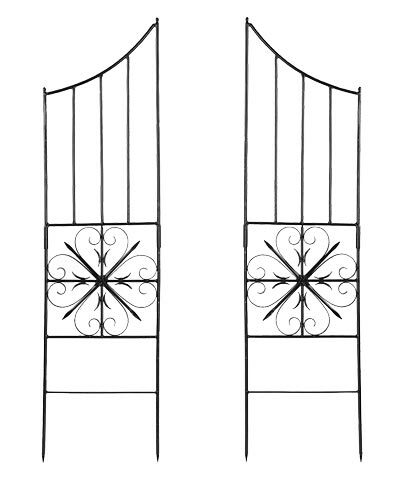 Note: This package includes 2 of the Achla Aldrich Trellis Side Panels, Graphite, 63"H each.